One of our goals is to bring attention to the devastating effects of hatred and intolerance, and explore common themes in the survivor experience. 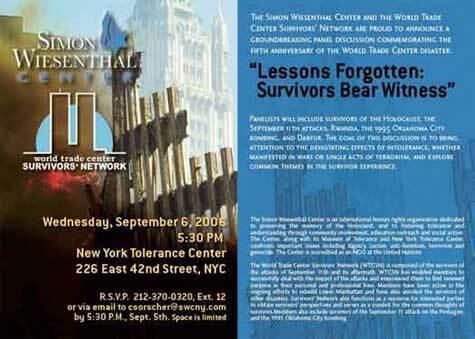 The World Trade Center Survivors’ Network, with the help of the Simon Wiesenthal Center*, held a groundbreaking panel discussion entitled “Lessons Forgotten: Survivors Bear Witness”. This event focused on survivors and their experiences, and was hosted by the New York Tolerance Center, located just blocks from Dag Hammarskjold Plaza and the United Nations. Panelists included survivors of the September 11th terrorist attacks, the 1995 Oklahoma City bombing, the Holocaust, Rwanda and Darfur. *The Simon Wiesenthal Center is an international human rights organization accredited as an NGO at the United Nations.